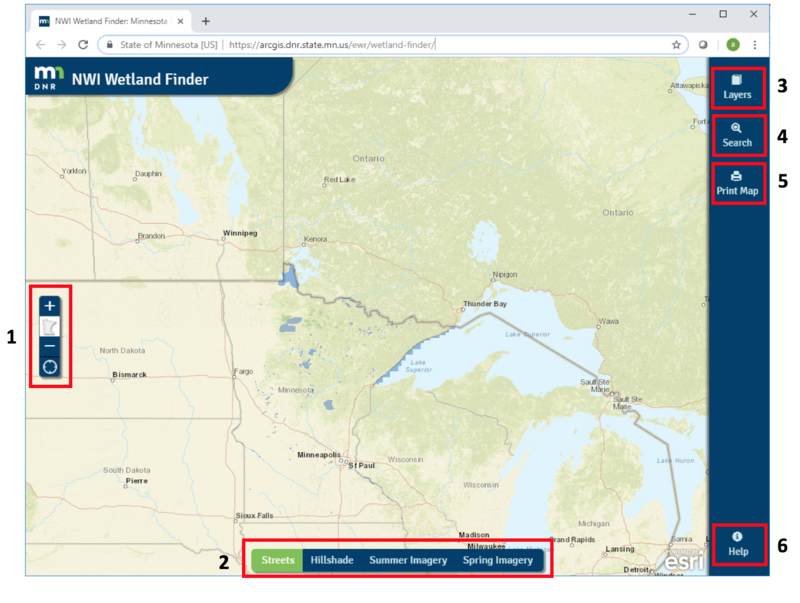 The Wetland Finder Application is a web-based mapping tool that provides access for all users to view modern wetland data. Future enhancements to the application may allow users to comment on data for submission to DNR wetland data stewards. This will create a living dataset with ongoing updates, reducing the lag time between statewide updates. Visit the National Wetlands Inventory Update project page for more information. For information about the National Wetlands Inventory data, refer to the User Guide to the Minnesota Wetland Inventory. Access the National Wetlands Inventory (NWI) Wetland Finder using a web browser. You must use a Firefox, Chrome, or Internet Explorer 9 (or above) browser. View the data disclaimer and then begin exploring updated NWI data. The default view is statewide but users can zoom in, search for a location, and click on the map to identify wetland resources. Clicking on a wetland polygon will display an ‘NWI Attributes’ information box. The box will contain basic information about the wetland polygon selected as well as links to Wetland Regulatory Contacts at the Board of Water and Soil Resources and the Department of Natural Resources. If the area clicked borders multiple wetland polygons, the number will be indicated at the top of the NWI Attributes box and users can cycle through the identified features using the next/previous arrows. Click the + and - buttons to zoom into and out of the map, or use your mouse wheel. Click and drag to pan. Change the background layer by clicking on the control. There are three different background layers: street map, hillshade terrain relief, and an aerial imagery layer. Cowardin: The Cowardin system is the primary classification system used by the National Wetland Inventory to describe wetlands and ecologically related deep water habitats. It is a hierarchical classification organized into ecological system, classes, and subclasses. The class and subclass levels are primarily based on plant community or substrate. Beyond this, the system also provides information on water regime and a variety of other special cases. Circular 39: The classification system known as Circular 39 is an older classification system developed primarily for the inventory and classification of waterfowl habitat (Shaw and Fredine 1956). Wetlands are classified based on the frequency and depth of inundation as well as vegetation community. This classification system has 20 different wetland types, of which eight (8) are present in Minnesota. Simplified Hydrogeomorphic: This system classifies wetlands not based on their plant communities, but rather based on their geomorphic setting (i.e. landscape position), water source, and hydrodynamics. Simplified Plant Community: This classification system is based on the Wetland Plants and Plant Communities of Minnesota and Wisconsin (Eggers & Reed 2011). Some of the distinctions between these plant community classes are difficult to reliably assess using aerial imagery data; therefore, for the NWI we have reduced the simplified this system to nine vegetated classes and one non-vegetated class. Public Waters Inventory data layer: This layer can be toggled on or off. Click the search icon to open a side-panel box. Use the search tool to quickly find an area on the map by location name, address or public land survey information. Click to export the wetland map view in a printable format. Access to the Wetland Finder Application User Guide. If you have questions about using this application, contact Steve Kloiber, Wetlands Monitoring Coordinator.